…and the truth about ARGs. Now that transmedia is everywhere and the Producers Guild of America have turned the ‘transmedia producer’ into a bona fide (or at least recognised) professional role one thing that rears it’s cross-media head is, who and where are the best transmedia producers going to come from? I have spent a good part of the last 15 years mentoring & training traditional & non-traditional media types in multiple platform content and now question where the best producers of this multifaceted ‘new’ content will come from – academia, film, book authors, social media consultants, game designers, TV, web developers, radio, advertisers, young, old, not yet born? Read on, a ‘hypothetical’ interview follows 🙂 and this is an opinion piece I cannot put in my book or lecture about! Firstly what is it and does it actually mean anything at all? It is fantastic that the term ‘transmedia’ is now so widespread across the industry and with the official credit (attached ironically to film primarily) but is it a bubble about to burst – is what we have come to know as ‘transmedia’ in danger of being blown out of all proportion. Everyone is a transmedia producer – yes you’ve made a website that is attached to a TV show, your a TP. Created a mobile game that has a line or two from the comic, you’re a TP. No one will police this – is it a truly integrated story environment, does it have clever plot links or consistent characters?. A TP is a decathlete (multi-skilled, hard to get a one word answer about what they do in a bar! 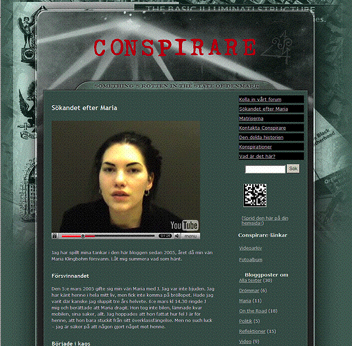 ), gone is nice and simple mono media, a TV producer makes TV shows, film director directs films. You can be a TP if you merge your story across two or more media areas? But more on this later in the post. We are still in the hype phase. Basically anything cool and different those transmedia types (and I point the finger at myself too btw) will take ownership of. I even heard the other day someone say Transmedia is the new Social media and augmented reality even gets a look in. I am not surprised those still getting their head around the ‘story’ potential of social networks or a cute mobile game find it all rather, dis-jointed. Also the increase in experimental and experiential ‘event’ based marketing suddenly meant transmedia is now inextricably linked with brand extensions (TV, film, product) – anything that is not a linear, branded film or TV show. I think for those who live in the transmedia echo chamber this has been the case for many years. It feels rather academic. Trans-media used to be an alternative semi-academic term to ‘cross-media’ (trans, from the latin ‘crossing’) but is now used to describe everything, non-linear, interactive, extension, participatory, social, brand, play, multi-platform, pervasive and so on. The idea that stories would be told in different places goes back thousands of years but in a modern media context a rich target for study and theorizing. Along came Henry Jenkins who coined the term transmedia almost a decade after the first basic cross-media incarnation. Henry admirably self confesses as being ‘too busy lecturing and presenting about transmedia, to partake’ of the industrial flavour of transmedia “some of it is not well done yet”. It is still a teenager. It has grown up before it’s time and become a troublesome big headed teenager without any true home and turned into a dysfunctional orphan at once protectively nurtured by over possessive academics, hijacked by experimental ad agencies and hardly understood by flailing stuck-in-time broadcasters. Originally cross-media was an intellectually stimulating concept – memories of mid 90s, pioneering BBC days also my old friend Brian Seth-Hurst who is “Referred to as “the father of cross platform” Hurst coined the term in 1998 as MD of Convergent Media at Pittard Sullivan”. Earlier definitions just talked about story based ‘crossing platforms’ element but since the exponential increase in social media as a place for millions to dwell it has suddenly had the participatory/social part added and also a suggestion that it is now a more integrated form of storytelling, I suppose I should have added a level 5 to my 5 year old (but about to be removed!) wikipedia cross media definition! Danger of being hijacked – Alongside all of this we have a ‘clique’ of so-called experts who try to describe something which is so simple on one hand (stuff on multiple platforms) yet so ambiguous on the other (fragmented narrative effervescence) – time will expose the Transmedia echo chamber I suppose. A Transmedia Narrative project or franchise must consist of three (or more) narrative storylines existing within the same fictional universe on any of the following platforms: Film, Television, Short Film, Broadband, Publishing, Comics, Animation, Mobile, Special Venues, DVD/Blu-ray/CD-ROM, Narrative Commercial and Marketing rollouts, and other technologies that may or may not currently exist. These narrative extensions are NOT the same as repurposing material from one platform to be cut or repurposed to different platforms. A Transmedia Producer credit is given to the person(s) responsible for a significant portion of a project’s long-term planning, development, production, and/or maintenance of narrative continuity across multiple platforms, and creation of original storylines for new platforms. Transmedia producers also create and implement interactive endeavors to unite the audience of the property with the canonical narrative and this element should be considered as valid qualification for credit as long as they are related directly to the narrative presentation of a project. Transmedia Producers may originate with a project or be brought in at any time during the long-term rollout of a project in order to analyze, create or facilitate the life of that project and may be responsible for all or only part of the content of the project. Transmedia Producers may also be hired by or partner with companies or entities, which develop software and other technologies and who wish to showcase these inventions with compelling, immersive, multi-platform content. But this post is not just about the word – there are hundreds of blog posts even now still trying to really get under the surface of what transmedia means and it is too easy to fall down the semantic rabbit hole of terminology and the endless subjective splits between academics, industry and wannabes. Perhaps something more concrete can be found in the ‘transmedia stuff’ itself. What is this stuff and who is making it? Lets choose three reference points. At one end of the spectrum we have the dabblers. Those who create a website for a TV show, a mobile game and if pushed ‘something else’ and call it transmedia. It may or may not have a parallel, adapted or continuous story thread, any social element whatsoever but they call themselves multi-platform, transmedia producers. In the middle we have those who wave the flag of ‘alternate entertainment’ but in reality are doing nothing more than TV or film programme extensions and putting 80s style ‘interactive’ (ooooo!) CD Roms on the web – you know those point, click, watch a video, solve a puzzle, quest efforts, perhaps a bit in a magazine or on a billboard but (note the cynicism) really a bunch of ‘video rich’ websites sitting on the coat tails of a TV brand that already has a few million followers eager to bond and help each other out. At the far end we are into pervasive gamer territory, experimental academics and installation artists – always trying to counter formulaic mainstream media for their audiences of tens or at most hundreds. I realise I probably sound overly cynical here but there is a palpable, odd smell in the air as the umpteenth major article on transmedia incessantly cites decade old Blair Witch, I Love Bees, Matrix and recent big brand ‘stuff on multiple platforms’ without any grounded references to the profoundly deeper transition phase we are in. The change only just begun and which is not about the ‘superficiality’ around linear brands but a much more profound journey towards social media entertainment and people powered play. Endless cryptic web or outdoor clues. Regurgitated 80s CD rom, anagrams or hyroglyph puzzles – Toynbee anyone? Good ARGs and transmedia storytelling are like a high quality wine, carefully planned, allowed to grow and mature and drunk with an appreciative social group. Are Alternate Reality Games leeches or leaders? Are ARGs and transmedia just a subset of social media? How is the success of ARGs measured? My simple chart captures some of the commercial vs self sufficient ARGs and those self confessed show extensions and it is pretty clear 90% of the player base will be in the branded/marketing zone. As regards the social element and given the natural collaboration in the games, the fact that media is mostly scattered on open social platforms (including the real world) and fictional characters often inhabit existing social networks, surely this is just ‘social and participatory storytelling’? Again there is no real answer beyond a semantic cross-over and common timeline. Which came first crowds flooding across platforms driven by social motivations (think mobile twitter, facebook, youtube) or media services encouraging consumers to move across platforms fuelled by their wonderful storytelling? I personally believe what we currently define as transmedia has been piggy backing on what we now call social media for the past 15 years. I was lucky to have a few drinks with Chris Sandberg a few months ago in Sydney. Many will know him as a key creator of ‘The Truth about Marika‘. We agreed in no uncertain terms that ARGs have two clear sides – ones that are purely big buck promotional and others that are about new form storytelling, creating something different, involving audience in a co-creative way. I won’t quote him on his view of ‘the commercial ARG’ but will in a longer post about to be published on the differences between story and brand based ARG and Augmented Reality – I extensively quoted from his talk on his own efforts in the area with Marika. OK this is the point in a post where you realise you have gone on way too long and not yet really tackled the intention of the title. The Academic – Often motivated by learning outcomes and therefore willing to put measurement and experimentation over a compelling story experience and practical implementation this type are good in research or early consultant roles but not in a producer role. Some academics are very useful in identifying emerging technology too – which might give you some PR or ‘cool’ness’ value, but nothing more. The Book Author – Ideally suited to planning the distributed story as good writers meticulously structure the narrative arcs to create something that in the mind of the reader really takes them on a mental, experiential journey. But as TPs (transmedia producers) these folk are not ideal as they are motivated again by control and authorship and even more worryingly locking down their content into the printed form (as if that somehow is the pinnacle of storytelling). “I am a published author therefore…” you know the rest. So they understand the social aspects even less than filmmakers but there are some good writers who really get gaming principles, to a certain degree. The Social Media Consultant – A new category of potential transmedia producer emerging. Ideally suited to build community over time and forge interplay between the social network members. There is a far richer synergy between social media and gaming/contributed media than the traditional media candidates and they understand what drives participation vs passive consumption. That said these folk are not usually storytellers or able to construct powerful and immersive ‘temporal’ fictional narrative – a good blogger, a magic realism storyteller does not make. They often fall down in ‘production value’ areas, coming from a mostly web background where good transmedia needs ‘authentic’ well produced video/audio as part of its mix, they are often left lacking. The TV Producer – Driven by eyeballs (either to justify public service remit or advertising dollar) this is all about volume. The most powerful ally of transmedia is broadcast episodic, able to bring story in a structured way over time to many people and move them around and across platforms. But even more than the filmmaker the TV show dominates. At first seen as a supporting role, the TV producer themselves reports upwards and even the most enlightened channel controller is more interested in TV ratings than web engagement. So the transmedia components are again relegated to a supplementary role. But these are probably one of the best candidates, producing content often in a live and rapidly produced context, a history of some level of discussion and experimentation with the audience – but TV to many transmedia consumers is now just part of video delivered to a screen and therefore unless it is appointment to view (live) the TV producer’s role is strong but not critical anymore. The Web Developer – Yes the obvious choice. Tell me about yourself. “Well I know php and mysql, developed a range of API mashups and …” Hold it there. Sure some webbies are great storytellers and many are not techies but spending most of their time producing web environments has produced a person suffering rather from ADD. They are great multi-taskers, able to respond quickly but cannot manage or create the 3 or 6 month story. Constantly shifting between mini stories on tens of key sites, some pushed (web 1.0) many pulled (soc media) it is all about the 3 minute YouTube-bite or 13 lined twitter thread and not about the enigmatic deeper story universe. The Radio Producer – A dark horse candidate. The talk-back producer especially understands how topic of conversation and story can be great call to actions for its listening community. Radio is also deeply embedded into location, not tied to cinema/tv/book but can exist almost ambiently yet powerful enough (as we found out with the 1950s War of World broadcast) to convince people that fiction is reality. The background and training of the radio producer though means they have had years of being locked in dark, dank studios and not had time to really understand multiple media – but definitely a candidate for the future. The Advertiser – OK those pesky advertiser types. Always quick to jump on the next big bandwagon and spread their messages. They understand how to grab eyeballs when and wherever they are – on the bus, in the toilet, lying on the grass in the park (oh and all those screens too). Adept at pulling attention towards them and locking people into experiences – but wait those experiences last a minute, ten minutes, maximum a few days. Not good enough Mr/s Advertiser. Short head experiences do not cut the mustard – you must extend, have longer stories and engage at multiple levels to be a real candidate for the job. Try harder. Young, old or not yet born – Right, hedging my bets or rather scraping the barrel now. People who are either too old to be caught up in the ‘confusion’ of current multiple platforms OR too young to even see the confusion. 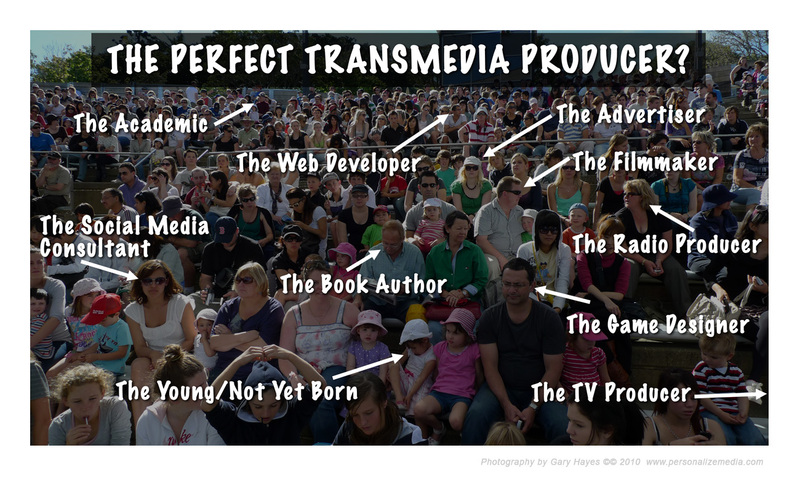 Of course it is likely that the best transmedia producers will come from those who do not care about the word ‘transmedia’ or what we (as media experts) think it is. They live and breathe this stuff without recourse to definition or formulaic trend. Out of ignorance comes bliss – ‘Being but Men’. Review this candidate in five years time. If you are considering becoming or calling yourself a transmedia producer make sure you are experienced in and/or deeply embedded across games, film, TV, media business, social media, advertising, web tech. If not consider becoming a great multi platform team manager. It is going to be hard to also identify experienced transmedia producers – those who are supposedly already good at it. Ones that have made a documentary with a contributory YouTube based element and won an award are hardly good cross media storytellers but will happily advertise themselves as ‘award winning transmedia producer’! Neither are those advertisers who made a cool augmented reality marker ad linked to a 30 second spot or a filmmaker who created a spooky ‘outdoor’ event in a city club related to their film. We will indeed have to wait for the stars to emerge. Which actually raises another critical question – Until we get a few stars (beyond brand focused agency types) what will attract the wannabe talent. Those ideal renaissance folk, adept in film & web & etc etc: who will see transmedia storytelling as something that will meet their needs, a part of their ego-system. For another post. A great post. And you raise many of the questions going through my mind. I’m new to the concept of transmedia, but not new to either Integrated Marketing Communication or to branding. Many of the examples of transmedia, particularly when it comes to marketing, sound a lot like what we talked about when IMC was a new concept (back in 1991), and very much like what Disney has been doing forever. Disney has created characters that exist in many stories in many different media. So I have been trying to discern what exactly is new about transmedia. The Internet interjects more opportunity for participatory content creation, so I can see that as a new element. Stories online or in digital form aren’t themselves very revolutionary. They are just other forms of media. However, creating opportunities for the average person to create and share stories around the world IS relatively new. But if that is the new model, then all the discussions about the transmedia producer branding comics, games, merchandise, etc. seem behind the times. .-= Suzanne Lainson´s last blog ..slainson: What sounds good to you is correlated to music training. @nytimesarts nyti.ms/dqfQu0 =-. Thanks for your comment Suzanne – nothing new under the sun and yes media marketing folk have been using transmedia techniques for eons. I have just tweeted to a similar response that the reason for the post perhaps is the ‘mystic’ around transmedia that on one side it is starting to be seen as an artform (intertwined story) and on the other the saviour of old media. So talk about raising expectations?! This has lead a little to heritage media producers suddenly jumping onto the transmedia bandwagon – one told me the other day (after having done a few web videos alongside their tv show) that now they were a transmedia producer they were now going to ‘get into games’ by buying a PS3 and trying some out, having not played any games before! Slightly disrespectful of deep rooted industry. Troubling times ahead as a new generation of old media producers, rediscover what you suggest is “behind the times”. Thought provoking post. Thanks Gary. .-= Scott Ellington´s last blog ..Everybody Loves Rebecca =-. Hi Scott (not sure whether your comment is part promo of a banjo player?!) but as a person with a deep rooted background as music producer/performer and the fact that many ’emergent media’ types often come from similar backgrounds I agree the ‘dynamic’ response of performer/audience (this includes good improvisational actors, comedians, impro dancers too) are ideally suited to the ‘real time’ nature of transmedia – but I would suggest most need to develop a broader skillset and knowledge. Thanks, Gary. No ulterior intent to promote, rather to cite a prime example of a creative stereotype that (I thought) didn’t make your list, more specifically people who advance their individual art(s) in collaboration with the individual art(s) of others; all of whom speak Audience, natively; with a passion for that which hasn’t been done to death previously — jazz musician, in a misleading, capsular thumbnail. Ah good re: no intent 🙂 Love your expression “speak Audience, natively” – about sums much of this up…those who really know how to engage vs push…cheers! I am also working on a post about multimedia and music and then a separate one on transmedia. So anything related to music in this discussion I am particularly interested in. A few quick comments as I just start to digest this (great post, btw!). As much as I hate to admit it, I am completely guilty of helping to spread this idea. I say this not out of a need to confess, but out of a desire to stop doing it but not knowing how. I’m not looking to for an answer here, it’s bigger than just saying “ARGs are a type of transmedia”. The problem is that transmedia is a wonderful umbrella for a variety of projects, but, as I alluded to in my own post on defining transmedia, until there’s a larger body of work to draw from it’s difficult to say what sits under it. ARGs are the most “mature” of projects – they’ve been around, they term is increasingly used in non-industry news sources without a definition, and they’re easy for me to explain. So it’s the example I give… repeatedly. So the question is, I guess, how do we stop defining transmedia using the ARG example in order to encourage non-ARG explorations when we don’t have a variety of good/strong non-ARG examples (outside of, say, The Matrix — my other default, heh). But more to the point of your post, I think you’re overestimating the amount of time before we have native transmedia producers (yes, I know was not a serious limit, but I’m running with it). They exist now and are increasing in number and in force. Heck, if I considered myself a producer, which I don’t, I’d qualify. Prior to my first transmedia project (an ARG… Lockjaw, 2002/2003) I had zero experience in anything that you mentioned. All of my related experience be it web or video or live event management, was born out of creating alternate reality games. Admittedly, I fell into all of this extremely early on, but I’ve seen and worked with a number of others like me. And there are more and more people coming into the field now whose first instinct is tell a story across media and to tell them that they have to work with just one media platform is almost blasphemous. It’s not because it’s the cool new thing and, like you say, it has nothing to do with definitions. Whatever it’s called, they don’t care, they just want to create and they believe that a story can be and, perhaps, should be told across those things that some people call platforms but are just tools in their storytelling toolbox. So screw waiting five years! I say we come back in a year or, maybe two. You sound like the ideal candidate having grown into multi platforms as if it was one cohesive whole, and as I indicated in the ‘not yet born’ category (read as: not yet emerged) the true TP is likely to be like the fish unaware of the water it lives in, and just uses the ‘whole’ as the tool. What I’m most interested in are discussions about transmedia as a truly new form of expression. But much of what I have seen has dealt with marketing. 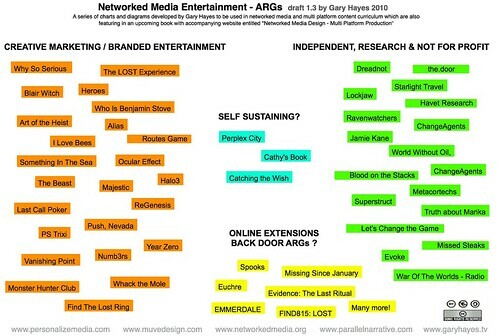 One thing I’ve wondered about, when seeing some transmedia projects plotted out, is the complexity. Some of the plans look as complicated as D-Day. Given that, aren’t the creators running the risk of having the project go nowhere because there aren’t the resources to pull everything together? I can see why marketing plays such a big role because you might have to find corporations to underwrite the costs of all of it. Can transmedia exist as a truly organic concept that evolves as it goes along rather than a Disney-style launch? I can’t speak for the other three examples, but beach volleyball is a multi-million dollar, global enterprise that doesn’t require talent, natural gifts, considerable investment of time and dedication, nor money…unless one wishes to make a living doing it, or even just do it well enough to truly appreciate other people doing it properly. Transmedia is not just a new name for merchandising, historically a hit for the marketing department. Transmedia is being championed by people who are trying to be qualitatively different from that cheesy brand of exploitation that came before, and multi-channel, long-form, layered complexity is probably as off-putting to potential audiences as it is expensive for likely investors with deep corporate pockets (for investment). Can transmedia production evolve from the drawing board into a truly organic magnet for global attention? Yes, especially if the potential audience learns to sing along with it as it evolves. Transparent nurture is not a typical corporate characteristic, and independent media isn’t the first place you look for deep pockets. So maybe. I was in sports marketing before music marketing so I am very familiar with professional sports. Just as a point of reference, my newsletters were used as curriculum materials in college sports marketing and management classes, I was on the editorial review board of Sports Marketing Quarterly, and I wrote a column on women’s sports business for Oxygen Media. Maybe I should have said kickball rather than beach volleyball, but I was thinking of a sport that anyone could do on a recreational level. Beach volleyball strikes me as a very laid back sport for the weekend participant. People of all levels are invited to play when it’s done for fun. Maybe every game has now gotten so competitive that novices aren’t invited, but it wasn’t that way when I used to spend time at the beach. Beautifully expressed and duly noted. It just seemed especially rude to fail to respond to your comment, even though it probably wasn’t addressed to me. Fifteen years of outdoor ball (in Golden Gate Park) nearly every weekend pronated me to key on the extremely fine distincition. A few portable DIY courts beside Morrison Planetarium is like an open mic. We picked up a 2-time All-American from Ohio State, but most people simply watched us, some warmed up with us, and the most persistent eventually wound up on the court in a process that (I think) strongly resembles the likely evolution of shallow-pocket transmedia production. Pick-up ball is mostly about the love of the sport, imperviousness to abuse/sarcasm and a wilingness to risk failure. Thanks Scott and Suzanne – you bring to the fore something that is so often lacking in ‘creative’ media circles, that of integration of ‘play’ – spectator and participator. Both ‘live’ sport and ‘performance’ music are a celebration of real time’ness and resonance. Transmedia is slowly inching towards that (or at least utilising flash mob methodologies) and I have covered in previous posts ( www.personalizemedia.com/transocialmedia-play-experience-alternate-reality-design/ ) that ‘transocialmedia play’ will be the organically developed form – evolving and without need for massive budget ($8mill for McDonald’s Lost Ring ARG?). This often comes up in discussion of ARGs as a hurdle to entry. A classic, weeks- or months-long ARG has such an imposing facade and is almost impossible to casually walk in on if you’re even just a few days behind. I’d argue that I would like to see _more_ of the quick, hours- or days- long experiences. Even those that are repeatable! Maybe they lack the huge community feel of a Big ARG, but for busy people who can’t get out there and lay out the time commitment, they’re whistle whetters. .-= Dee Cook´s last blog ..How This Works: =-. Looking for a philosophically aligned transmedia producer to play with. So what’s a philosophically aligned transmedia producer look like ?